Although there has not been much fall weather over here on the West Coast, we're slowly getting there. I have patiently waited for the coolness in the air and we finally got some of it last week. I for one have welcomed the fog back with open arms in SF and I've never been happier to be gray. We had a week of cool weather and now its hot again. LOL Love your outfit Nancy. Gray is so pretty. you look so amazing in all grey! xO! We don't really have the moisture here in Colorado to have fog too much so when it happens it is so magical! I love your grey look! Love the monochrome grey. It's very chic. This outfit is so perfect for this time of year. I kind of want this entire look! I always love a great monochromatic outfit, and this one is no exception. That cardigan is such a perfect addition and it look so cozy...even if it's not technically cold outside! This outfit is so beautiful! I love all the gray tones .. very pretty and I may try this ! Love this grey out look! Always so chic - love the monochromatic look! We are finally seeing the cooler weather today, I am so excited! That cardigan looks so warm and cozy, love it! you rock the all grey! super cool look! 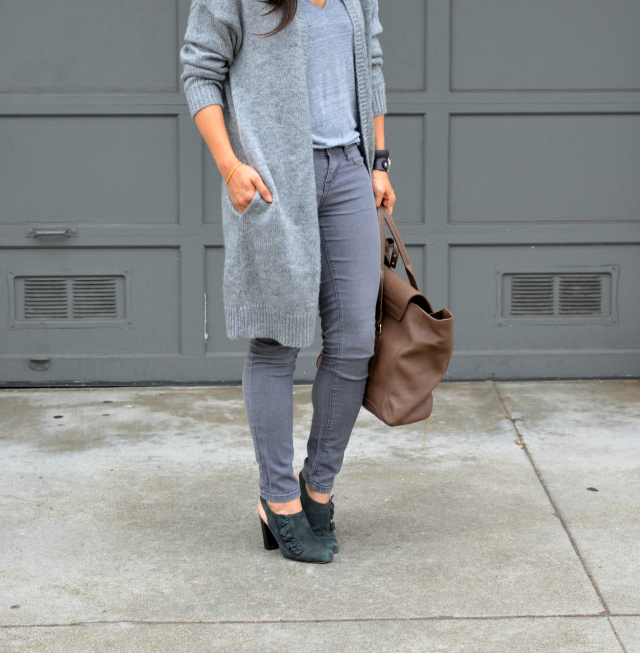 Love this all grey look! We just got some cooler weather here and I'm really excited! All the shades of grey going on here and looking fabulous! Love the grey layers with the touch of caramel! Gorgeous! The boots are so pretty, too! and your hat makes nice statement ! it is warm in New York today, going to be 70! I am wearing short sleeves..?